Aberdeen Harbour has direct trading links with around 40 different countries around the globe, this means that more than 100,000 vessel crew members visit the port each year. 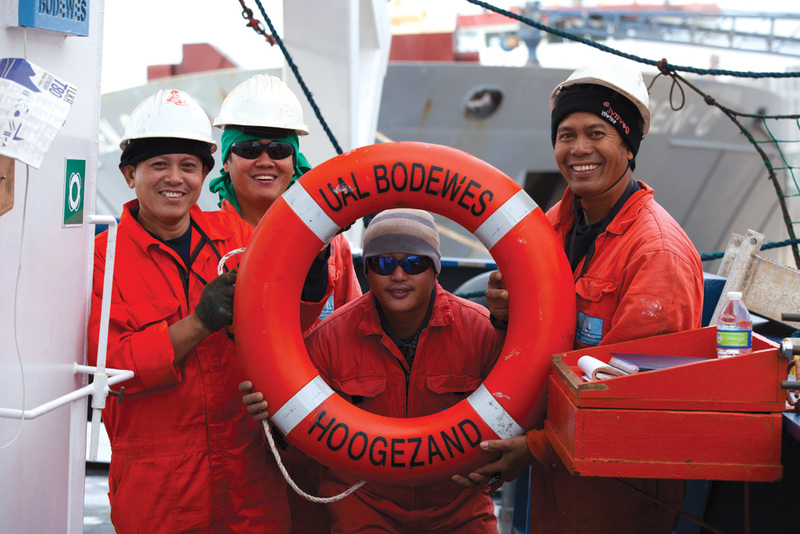 We were keen to gain insight into what life is like to work on one of these routes so we joined up with the crew of the UAL Bodewes. Captain Aries and his international crew, of Dutch, Russian, Ukrainian and Filipino crewmen, set out from Aberdeen in late October. Their 11-week journey took them to Egersund in Norway, then on to Antwerp in Belgium, Las Palmas in Gran Canarias, before heading south to Porto Amboim and Luanda in Angola, and then back to Aberdeen. Captain Aries told us about the UAL Bodewes; “The vessel is named after the Dutch shipyard in which she was built in 2012, she accommodates a state-of-the-art wave-piercing bow shape, which allows the vessel to operate on approximately 13 tonnes of fuel per day, as opposed to the 20-25 tonnes a vessel of her size would normally use. The cargo is predominantly oil & gas related pipe, equipment and chemicals, as well as refrigerators with frozen food”. Rough weather and boredom are the two most difficult things to deal with on any long sea voyage, but UAL is focused on the wellbeing of the crew. “We allow our crews to use laptops and tablets to communicate with their families at home – a luxury not often available to crews at sea. I believe this is a real moral boost for the crew, who are away from home for months at a time. Security fears can also be a major factor when visiting African ports, and the vessel has both procedures and safeguards built in to mitigate these risks. When in a high-risk port, UAL provides quayside security for its vessels, and my crew do not disembark during their time in port. We are always watchful for pirates when at sea too, but we have been lucky to date and never been threatened”. The journey takes two and a half months in total, after which, Captain Aries and his crew look forward to some time off before their next assignment.